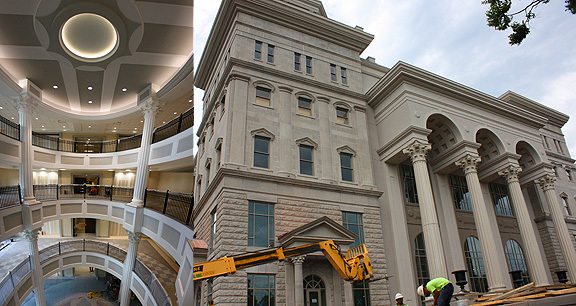 Project obstacles and solutions: In 2011, Belmont University announced plans to build the Wedgewood Academic Center - a 160,000 square foot, five-level-multi-purpose building on their Nashville campus. The building included a 4.5 level parking garage, a chapel, a dining area, numerous classrooms and a four story atrium. In keeping with the architectural theme, the Wedgewood Center was designed in a Greek revival style. R.C. Matthews was awarded the contract for the building as part of a major capital improvement by the university. This included the Wedgewood building as well as multiple new buildings, athletic fields and renovations to existing structures on campus. The Wedgewood project was started in May 2013 and was to be operational by the start of classes in August 2014. Timing on a construction project of this size is critical. Working from an academic calendar, with turnkey expectations and hard deadlines means that any delay can have a ripple effect that would hamper the entire project. It is imperative that building materials are to spec and on time. IMI supplied concrete for all phases of the Wedgewood construction; from the early foundation work, to the pillars and decks of the parking garage, to the post-tensioned floors, to the sidewalks and steps surrounding the building. IMI QC/QA worked with the engineers to make sure the concrete mixes were to specifications and with the site supervisors to make sure the mix was workable for the finishers on the job site. Dispatch and drivers made sure the flow of concrete to the site was on time and readily available to keep the job moving along. For instance, the columns of the parking garage needed a 7,000 psi mix. IMI used fly ash as a reactive pozzolan in the mix. Fly Ash is a supplementary cementitious material that reduces water demand, improves workability, finishability and provides an increase in strength gain at later ages. The elevated floors required a different specification that included admixtures to enhance early strength in the concrete so the post-tensioned cables could be stretched. The floors had to reach 3,000 psi in three days and 5,000 psi in 28 days. IMI provided extensive testing on the concrete for the columns and the post-tensioned floors. The Wedgewood Academic Center is on track to open in August.